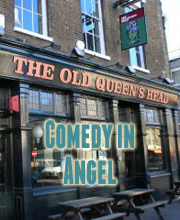 Laugh Out London returns to The Old Queen’s Head in Islington for another excellent bill of stand up talent, headlined by the incredible SARA PASCOE. Out and out one of the most interesting and funny acts on the circuit. Telly appearances include Live at the Apollo, QI, The Thick of it & Never Mind The Buzzcocks. Sara has recently had massive success with her first book “Animal”. Fern’s Edinburgh show “Male Commedine” was a massive success, bringing a huge wave of critical praise her way. TV appearances include the Stewart Lee curated Alternative Comedy Experience and 8 out of 10 Cats. Fin absolutely stormed the Fringe this year with his bold look at white privilege (the brilliantly titled “Whitey McWhiteface”), which resulted in one of the most memorable shows of the festival . He’s also a member of cult comedy group the Bearpit Comedy Podcast Podcast. Star of Channel 4’s Friday Night Dinner, ITV’s Plebs and BBC’s Flat TV, Tom is an emerging talent of the UK comedy scene.